What color is whipped cream? What color are polar bears? NOTE: You likely answered, “Milk.” But do cows drink milk or make milk? My girls loves Disney movies and shows. Do you recall, what mouse walks on two legs? And..what duck walks on two legs? You probably answered Mickey Mouse to the first question and Donald Duck to the second question. But don’t all ducks walk on two legs…not just Donald Duck! Here’s a simple question to put your Biblical knowledge to the test: How many of each kind of animal did Moses bring on his ark? If you answered “two,” you’re like most people … and you’re incorrect. It was Noah who took animals on his craft, not Moses! Kenya is a country in? The opposing colors on a chess board are? Multiply that number by 9 . Remember the last letter of the name of that country . Remember the last letter in the name of that animal . Think of the name of a fruit that starts with that letter . Now, chances are you ‘re thinking about kangaroos eating oranges in Denmark! These exercises show how we are not as free thinking as we think we are. We can be led to all kinds of conclusions just by the things we are told, the questions we are asked, the info given to us and not given to us. You are not as free as you think…and the world around you takes advantage of this all the time. You make all these decisions according to someone else’s pre-designed purpose and yet you walk through life thinking you freely make choices as an independent individual. So much of what we do is just a ruse put on by marketing experts, salesmen, advertisers, corporations, fundraisers, architects, designers and on and on. The truth is we are enslaved to lots of things around us in ways we would believe if they were staring us right in the face. Even now you are probably thinking to yourself….I don’t make impulsive decisions, commercials don’t manipulate me. But the truth is that they do. We don’t like to think about being enslaved. But the truth is we are all slaves to something or someone. Paul understands this. For him slavery is simply surrendering your life to the control of another. And when you think about it this way, we are all slaves. Some of us are slaves to liberalism and some of us are slaves to conservatism – each taking in the dogma of one or the other and then renouncing the other as wrong, evil, or ignorant, listening to the views of radio show hosts, partisan political commentators, effectively becoming slaves to partisan ideology. (And chances are if you are conservative then right now you are thinking about how the liberals do it. And if you are liberal, then you are thinking about how the conservatives do it. The truth is they both do it. And if you find yourself on one side or the other, then you have almost certainly been affected by their tactics. Paul explains what I mean. (Read Romans 6:12-23) He does not encourage us to be free from everything, to do whatever we want. Not at all. Paul instead paints a black and white picture saying that we are all slaves to either sin or to God. No ifs, ands or buts. Very clear. You are a slave to sin or a slave to God. According to Paul, There is nothing wrong with having a master. It’s just a fact of life, of being human. We all have a master in one way or another. What matters is who that master is. Is your master God or something else? There are things that are Godly. And things that are not. Either you will be obedient to one and disobedient to the other. Or vice verse. Sound familiar? You either serve God or you serve something else that is not God. There is no option of being master-less. Again, The question is who or what we serve? 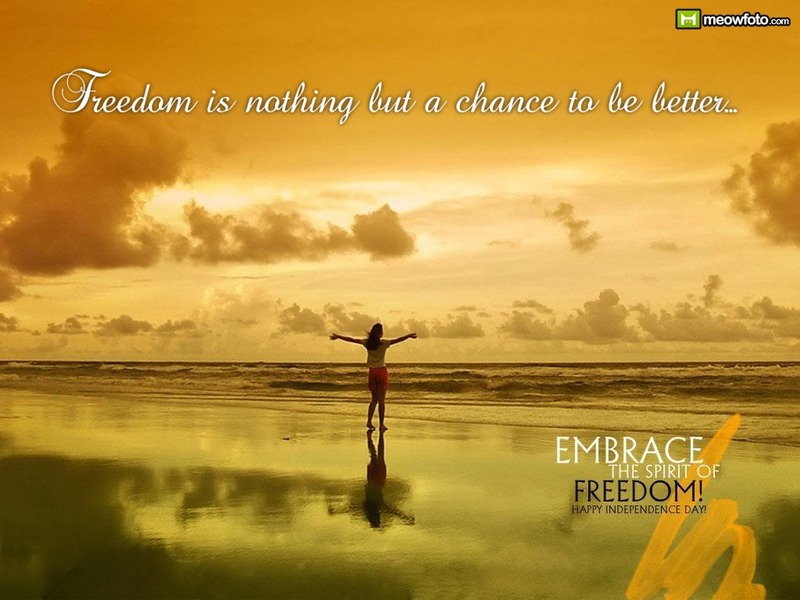 Independence – being free from another. In our case, it is freedom from Great Britain, from colonization, from taxation without representation, from monarchy, from religious oppression. We do not simply celebrate Freedom to do what we want. We celebrate Freedom from oppression, freedom from the proverbial foot on our necks, freedom from powers that would use us for their purpose, for their selfish end without concern for our livelihood. July 4th is not about being free to do whatever you want. Though I think a great many people in our country have forgotten this. We fought for freedom to collectively govern ourselves. We did not fight for freedom from taxes, we fought for freedom to determine taxes as a collective. We did not fight for freedom to lie, steal, cheat, or murder. We fought for freedom to collectively create a system of justice over such actions. We did not fight for freedom to have no rules, we fought for freedom to be able to have a voice in the rules that were made. In other words we did not fight to be free from everyone and everything. We fought to be free from a particularly oppressive country (Britain) and free for a particular way of live that we now call democracy. Paul has something similar to say. He is not talking about a freedom to do whatever we want. In fact, Paul describes that freedom as sinful – doing what you want without the good of others in mind is really just sin telling you what to do. God’s freedom is different. It is a freedom to follow God, freedom to listen to God, freedom from the power and the effects of sin, freedom for Grace – a Grace that comes by being slave to God. It’s sounds ironic. We are free from this in order to be slave to that. Free from sin so that we can be enslaved to God. But as Paul says and as I hope the examples I suggested to you at the beginning show…we are all slave to something. Freedom is about having God as your only master because in God we find what freedom really means. Freedom to do right. Freedom to love everyone. Freedom to walk the extra mile, to give your coat as well, to love your enemy. Freedom from evil so that you have the opportunity to be good. I am free in the US because I am not bound by an oppressive power that would seek to step on my throat, use me for its own advantage. And I will celebrate that freedom this Independence Day. And as I celebrate this freedom, I’ll remember what Paul says….that even when I am free from evil powers, that does not mean I am free to do what I want. Because if I simply act as I want then I have simply traded one sinful master for another. And to be honest, I fear that this is what far too many citizens of our country are doing. It is what they will celebrate this weekend. Their freedom to sin, their freedom to follow their own desires. And that, according to Paul is not freedom at all. It is being a slave to sin. Instead, I celebrate Freedom by exercising my trust in God as my master, my reliance on God as my Lord, and by following the way of my master God through the life and teaching of his son Jesus Christ. And God’s way, according to Paul, is marked by love of God, care and compassion for others, and honoring, respecting and cultivating all of God’s creation. When you exercise your freedom to listen, to love, to share and to care, to show grace, to be merciful, then you will find your eternal freedom in God…a freedom that is coming closer and closer each day because you are following the one who created us to be free in him.